We’re looking at two major content trends from 2012. 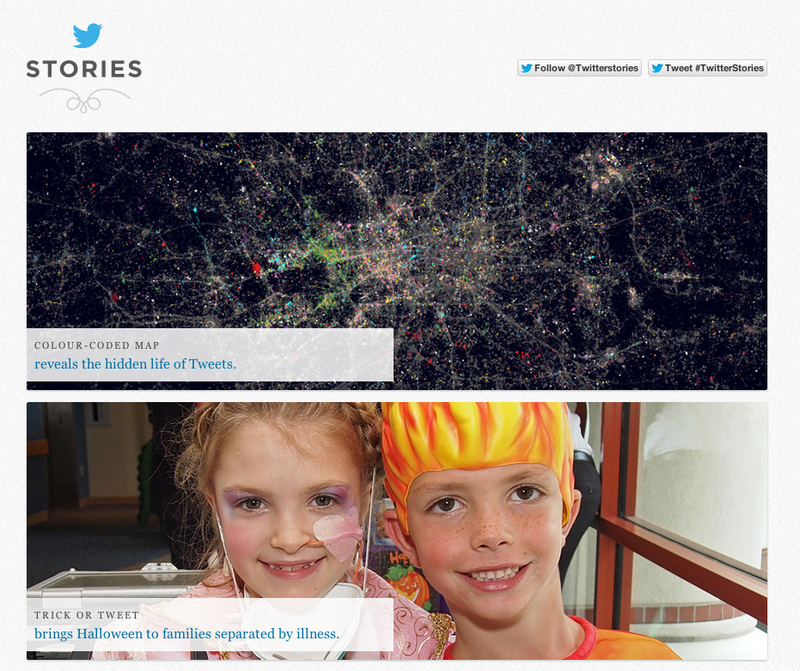 Just over a year ago the Web met Twitter Stories, featuring short segments exploring the stretched-out narratives behind a range of brief tweets. In an early look at what 2012 would offer, the platform had become the storyteller. The Twitter handle for this content project now boasts nearly 550,000 followers. Seems like people like stories. Fast-forward to August 2012, and one could see Facebook use Twitter to announce Facebook Stories. That first video segment — “Remembering” — was poignant and very well-done, earning Likes from many and some skepticism from others. What I didn’t know until writing this post: “Facebook Stories,” as this 2010 blog post from the social network explains, actually began as an app. Apparently, Facebook made the decision that rather than just provide an infrastructure for users to tell their stories, they’d act more like polished media producers and handle some of the storytelling themselves. Wait, what about Tumblr, with its, oh, 20 billion pageviews per month? Yep, also in summer 2012 — actually, before Facebook’s announcement — Tumblr introduced Storyboard. We’re excited to announce the official launch of Storyboard, our new hub for in-depth conversations with Tumblr’s creative community. We’ll be posting regular features on creators working in and around Tumblr’s massively diverse cosmos — writers, musicians, animators, scientists, artists, archivists, chefs, comedians, or anyone else with a great story to tell. Today we’re talking about Michael Stipe, the New York Times, Afghanistan, and the design mechanics of the Tumblr Dashboard. The Tumblr editorial team has published a ton of stories on a range of topics since this summer. Whether it’s truly “original journalism” — as one of the site’s tag lines puts it — is still being debated. What’s clear, though, is that non-media brands are also getting in on the action. What sets ‘Why VW’ apart from other storytelling platforms is the integration of our own content with the real-world experiences of VW owners and fans. If someone wants to learn more about Volkswagen performance or a specific model, they will see relevant consumer stories side-by-side with information we provide. Way back in January, I was reading about Coke’s transition from pursuing Creative Excellence to pursuing Content Excellence, and now here was the Stories website to prove it. Red Cross Stories caps a story-filled year. We often talk with clients about how to take this more editorial approach on their websites, focusing more on crafting narratives instead of just punching out marketing points. But as we also point out, it’s helpful to leave your own house now and then. Consider producing content that’s living out in the world, far from your own home — even under the roof of another brand. The most obvious example of this in 2012 is Pinterest, which launched Pinterest for Business in November. It may not have seemed inevitable or even logical that, say, a pet insurance company would make a “scrapbooking” site like Pinterest part of its marketing operation. But it’s happening. Take a look at Pinterest’s case study for how this brand is using the site. Also this fall, LinkedIn announced its entrance into the publishing game with this post: “Introducing the Ability to Follow Thought Leaders on LinkedIn.” I was impressed to see Flickr co-founder Caterina Fake among those recruited for this content project, but as of now, she’s published just two posts. McKinsey’s David Edelman has had more on his mind. That’s a reason for LinkedIn and for the user — but what does Edelman (or Fake, or Richard Branson) get out of it? In short, they know you can’t just assume an audience will come to your house to hear you tell a story. You’ve got to also tell stories where they already are. I’ll close with a focus on the bottom-left Collection, “American Dreamers,” since the backstory is interesting. The independent Portland agency has launched a new unit called Sharp Stuff that is dedicated to finding and telling simple, memorable stories in new and interesting ways. Precisely what products that will yield is not yet entirely clear, said director Nick Barham. But at the very least the work will expose agency creatives to new ways of thinking about storytelling. So how does Medium fit in? Rather than introduce and promote the book only on their own website, Sharp Stuff jumped on the chance to do so away from home, on an easy-on-the-eyes modern platform that seems to be gaining serious steam. Giving up traffic and design control was worth, the Medium team decided, the added exposure of being part of the larger network. Looking ahead past the holidays, we think 2013 will be an incredibly interesting year for online publishing and digital marketing — for storytelling in all forms. How will the continued rise of mobile/tablet platforms shape how stories are crafted and consumed? How will your own brand take advantage of the fantastic storytelling tools out there waiting to be used? How will ours? We can’t wait. What a great time to be talking to — and with — the world.